Starring Dilireba (迪丽热巴) and Deng Lun (邓伦), the romantic comedy drama Sweet Dreams <一千零一夜> has premiered on June 25, 2018, on Hunan TV. As their first collaboration, fans are looking forward to the new show, which centers on the love story between a florist and his employee. Dilireba stars as Ling Lingqi, a kind-hearted girl who is full of dreams, but lacks self-confidence. 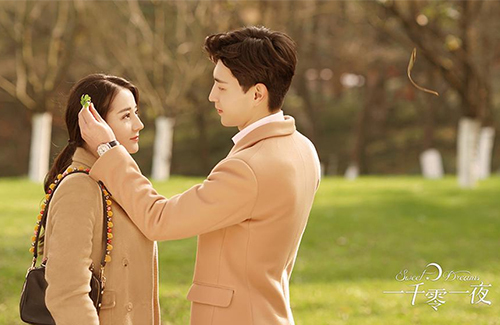 She has a crush on Bo Hai (Deng Lun), a florist, but he does not reciprocate her feelings. After accidentally participating in a research study about a new sleeping device, Lingqi finds herself with the ability to walk into Bo Hai’s dreams. He may not look as handsome as some other actors, but he is very likeable. People often say beauty (in this case, it’s handsomeness) is in the eye of the beholder. 🙂 He does have a great smile though! @m0m0 I thought so too until I watch ‘because of you’. He was very charismatic and has a really nice smile. He was very good,funny, loyal and furiously protective of his gf in the drama. He really grew on me. I think he’s really adorable. Give that drama a try. perhaps he should undergo facial reconstruction to suit certain fan expectations of a typical pretty boy?